If you’ve never heard of Herman Schultheis, you’re not alone. 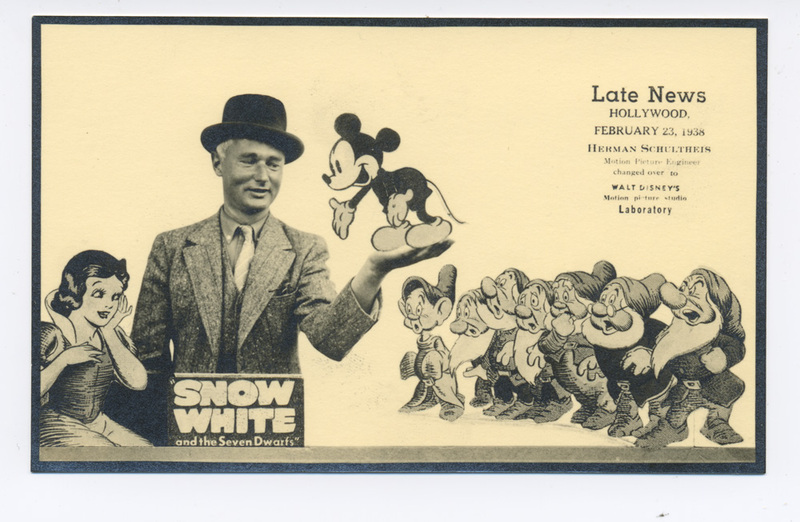 Ironically a relentless self-promoter who may have suffered from a persecution complex, Schultheis was a minor employee at the Disney Animation Studios from 1937 until 1941, during the period that saw their best output: Pinocchio, Bambi, Dumbo and Fantasia. Schultheis was born in Germany at the turn of the century and emigrated to New York just before the Depression. He considered himself a jack of all trades (though some of his co-workers would contend that he was a master of none), and was fixated on working in Hollywood to show off the talents he thought so highly of. Though not an animator like Ub Iwerks or Ward Kimball, Schultheis did have an art of a kind: his technical skills in photography and photo manipulation. Once he was finally hired at a studio after years of doggedly trying, he helped improve the studio’s workflow with tests that brought greater clarity to animation photostats and Kodak’s photochemical wash-off relief cels, which reproduced animation sheets more faithfully than hand-inked cels did. But anything he may have added to the films seems dwarfed now by the release of this immaculately kept and fully annotated notebook, which contains innumerable notes and diagrams on effects shots, research photographs, promotional stills and photographs of life at the Disney Animation Studios: men and women at work creating timeless films. From an animation standpoint, the notes and diagrams are an amazing discovery. The trove of details and technical drawings about how effects and gags were done, diagrams and test drawings (especially of the multiplane camera shot that opens Pinocchio) is an especially exciting find. From a film history view, it’s the behind-the-scenes photos on the lot at the new and old Disney Studios that make the price worthwhile. But I would come to a full stop before calling this Disneyana, which is, let’s be honest, a catchall term for the least interesting of all things Disney. This is an animation history book that just happens to document Disney. If Schultheis had worked at Warner’s or Hanna-Barbera, it would be just as insightful — though the period he worked at Disney was particularly interesting because it was during a time before the employee strike, when Walt didn’t seem to care about inflated budgets as much as the quality of the animation. Schultheis was a polarizing figure inside the studio, however. He had his champions, but also his critics, the most vocal of whom was fellow effects man Bob Broughton, who called Schultheis a glory hog, allowing that he made contributions to the films, but never as the chief innovator. In the notebook that Canemaker’s book reproduces in full, it’s rare to see anyone else’s work, or at least anyone else credited for their work. If you didn’t know better, you might think that Schultheis was Walt Disney’s secret identity, so much credit is taken. It goes further still: There were whisper campaigns about Schultheis being a Hitler-lover (doubtful) and a Nazi spy (very doubtful), and in maybe the worst insult someone could give at the time, Broughton called him the least member of the Disney family. He may have had personal failings and been the least enmeshed member of the Disney family, but sometimes that’s the only way you get to take all of the pictures. This entry was posted in Articles and tagged book reviews, Disney. Bookmark the permalink. Can the Maya Rudolph Show survive the fact that no one likes variety shows?